Welcome to the Upland Gear store. We will be adding new items on a continuous basis. 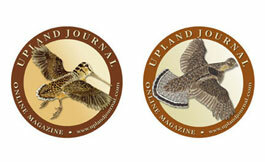 Look forward to additional Upland Journal clothing, merchandise and much more. Unstructured, low profile, polyester crown, brown-waxed canvas visor, tuck strap with buckle closure. Embroidered UJ Grouse or Woodcock logo with www.uplandjournal.com arched on back. Structured, low profile, 100% cotton, Velcro closure. Embroidered Upland Journal Grouse or Woodcock logo. 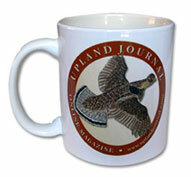 11 oz Ceramic Mug with high resolution, full color printing of Upland Journal grouse logo. Medallion of solid brass, gold plated, filled with enamel colors with either Pewter or hand-colored centerpiece.1.25". 5.5" x 4.25" Ivory cards with envelopes, folded, blank inside. Grouse or Woodcock, full-color 3.5" decals for outside of window or other surface. A simple and elegant display/plaque that can be placed on your desktop or mounted on a wall. Individually handcrafted with brass hardware and a clear satin lacquer finish. Available in Black Cherry (light wood) or Black Walnut (dark wood). Includes instructions on preparing your grouse fan. 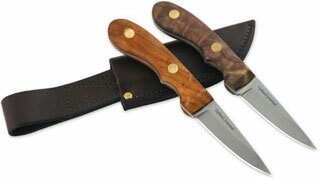 440C Stainless Steel blade, brass rivets, and choice of oil-finish Cherry or Black Walnut handle. Tanned leather sheath. 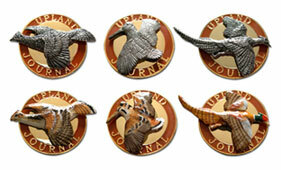 "Upland Journal" is acid-etched on the blade. Fits perfectly in the hand for dressing birds and wild game. Hand-made by knifemaker Michael Stenstrom. Blade: 3". Length: 6 3/4". 3-6 weeks for delivery. We will try to ship within one week of receiving order. If an item is out of stock or delayed, we notify the customer via bulletin board PM or e-mail. Customers may then choose to cancel or wait for the backorder. We ship via U.S. Postal Service by Priority or First Class Mail. All orders are guaranteed to your satisfaction or you can return any item for a full refund.